When I became CEO of Young & Rubicam, an industry website famous for its anonymous postings called my company a dinosaur, with all of the associated imagery. I was reminded of that posting last week when I took my grandson, Teddy, to the Museum of Natural History in New York City to, amongst other things, see the dinosaurs...their bones, fossils, eggs...you know...it is a ritual that was established in our family when I was his age...passed on to our daughters and now onwards. I don't know about you, but I have always been fascinated and enthralled by dinosaurs and such. In fact, during my archeologist/paleontologist phase I really wanted to be one or the other...early Indiana Jones/Jurassic Park fantasies long before the movies. Truth is, there is a global fascination with dinosaurs that goes back centuries and no doubt was where the legend of the fire-breathing dragons began when some unsuspecting digger uncovered the fossilized remains of a pterodactyl. Admit it...I am not alone here...you kind of like them too...no? Dinomania is so powerful that it has become a cultural institution. There is an even deeper dinosaurian connection, though. Whether it's noting the time a specific dinosaur lived, or comparing their size to a double-decker bus - the popular standard for dinosaurian measurement - we're constantly considering dinosaurs in relation to ourselves and the world we know. Dinosaurs embody the drastic changes that life on Earth has undergone, and give us access to some of the most powerful truths our species has come to understand - that our planet has an incredibly deep history, that life has changed constantly through time, and that extinction is the fate of all. But here's the thing - once it was "common knowledge" that those slow, lumbering beasts with small brains and equally small intelligence had failed to evolve and adapt to the changing environment of the world...the implication being that the world advanced and they couldn't keep up, ergo they are gone. What actually caused their demise? A second spike on the thermometer, about 1.1C, followed some 150,000 years later, around the time of the impact. Now, a paper just published in Scientific Reports has named another possible conspirator: crude oil. According to Kunio Kaiho and his colleagues at Tohoku University, in Sendai, Japan, the sudden ignition of underground oil at the Yucatán impact site could have jetted into the upper atmosphere a mass of fine black carbon, also known as soot. Human-made black carbon, the bane of Beijing, remains in the lower atmosphere for only a matter of days before falling back to the surface, where it warms the planet by absorbing heat. But black carbon injected into the stratosphere would have the opposite effect, acting as a long-lived sunshade that could abruptly cool Earth and inhibit photosynthesis over a period of years. Kaiho's team suggests that the asteroid may have sent up as much as three billion tons of soot, hundreds of times more than the world's industries release each year. Petroleum - the ectoplasm of ancient organisms, our shameful Anthropocene addiction - may have come back to haunt the dinosaurs, too. In summary...some combination of natural climate change plus the huge accelerator of natural disaster, some sixty-five million years ago, caused the dinosaurs to die out along "with more than 50% of other life forms on the planet." Bottom line...the notion of the dumb dino being pushed over by smarter and better-equipped species is no longer the gospel and I refer you to the living dinosaurs all around us who in fact have survived and thrived. 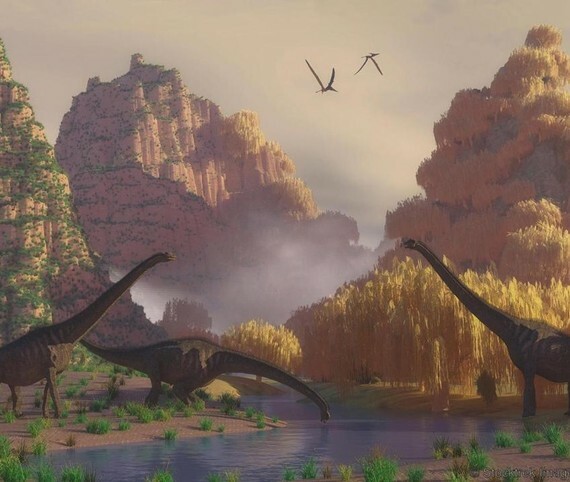 More importantly, I point out that non-avian dinosaurs died out 65 million years ago after being the dominant life-form on the planet for 170 million years. Homo sapiens first appeared about 200,000 years ago. We have a way to go...a long way. Frankly, I wonder who the real dinosaurs are today...the giants who roam the earth they rule but who are oblivious of that huge meteorite hurtling towards them. Companies like mine are not and never were anything like the mega-giants of today or even akin to those lesser in size but equal in hubris and valuation. We followed innovation and innovated creatively ourselves inside those innovations...print, radio, cinema, TV. We perfected the art and science of storytelling inside of them all. And yes, as an industry, we missed the start of the digital age - we mistook it all for technology and didn't understand the opportunities and innovation we saw before. But we have caught up...dodged the meteor, and thanks to Teddy, I have had the revelation that the term "dinosaur" is misapplied and misused.